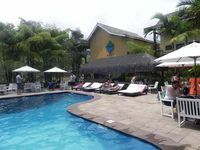 Properties in Praia do Curral average 4.7 out of 5 stars. 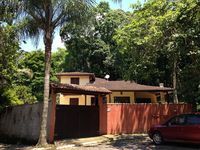 House w / pool for 8 people, stunning view of the sea and Atlantic forest. Property 1: House w / pool for 8 people, stunning view of the sea and Atlantic forest. Beautiful house in Piúva for up to 10 people 600 meters from the beach Goats Island. Property 2: Beautiful house in Piúva for up to 10 people 600 meters from the beach Goats Island. House 100 meters from the beach with all the fun, in a gated community. Property 9: House 100 meters from the beach with all the fun, in a gated community. House 3 suites c air cond and TV, barbecue grills gar for 3 cars 200m from the beach. Property 20: House 3 suites c air cond and TV, barbecue grills gar for 3 cars 200m from the beach. Property 22: ILHABELA IS THE BEST DESTINY OF THE GREEN COAST. A LOCAL HOUSE WITHIN CONDOMINIUM ..
Property 29: MARESIAS - Front w / Beach - Cond. Closed - Heated Pool !!! Property 34: Chalets 80 meters from the Curral beach in Ilhabela. Beautiful view of the sea. Property 39: ILHABELA - EXCLUSIVE STREET, CONDO CLOSED. Casa Ensoladara on Pauba Beach. Property 42: Casa Ensoladara on Pauba Beach. Quiet and tranquility with comfort - Is it what you are looking for? Property 47: Quiet and tranquility with comfort - Is it what you are looking for? Todo muy bien. El lugar muy lindo y confortable. El personal muy amable y servicial. Fauze un propietario excelente. Contesta enseguida. Me encant&oacute;. Lo pasamos muy bien. Estivemos hospedados na casa do M&aacute;rcio que nos recebeu muito bem, sempre gentil e receptivo, e sua casa muito bem equipada com todos os utens&iacute;lios necess&aacute;rios, espa&ccedil;o aconchegante num condom&iacute;nio muito tranquilo e bem localizado!